8th August update:- Thanks to Fudoh from the Shmups forum for pointing out that, in actual fact, any Extron RGB interface will work for this trick, read on for details of how to connect other models besides the 580xi (pictured on the right). If you use your DVDO Edge with an XRGB3, or an Xbox (the first Xbox, not the 360) games console and a VGA cable, you may have noticed the picture dropping out or blanking periodically in some situations. This is known to happen when using the Sega Master System converter and the XRGB3 and DVDO Edge in tandem. Thanks to a little creative experimentation, the incompatibilities discussed above have all but been solved, thanks to the Extron RGB interfaces. Of course, Extron didn’t create these units for the purpose of improving the DVDO Edge’s compatibility. What these units are actually intended for is for use in places like lecture halls or board rooms. The Extron unit can be mounted somewhere under a desk for instance. Then when someone wants to give a presentation or a lecture, all he/she does is plug their device into the Extron. The cabling to the display is then tucked away neatly, reducing cable clutter and eliminating the need to rummage around the back of a display device to connect the desired equipment. I’m not setting up a lecture hall, what good is it to me? The Extron interfaces have a couple of neat tricks to do with how the sync signal is processed from the incoming VGA signal. Extron’s “Advanced Digital Sync Processing” was what initially piqued the curiosity of the retro-gaming community. 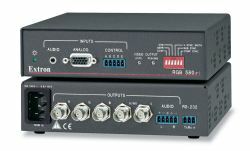 According to Extron, ADSP – Advanced Digital Sync Processing is “an exclusive Extron technology that conditions sync signals to provide reliable operation with a variety of signal sources and display types. ADSP reshapes the sync signals, restores proper TTL voltage levels, and maintains the original video to sync timing relationships while allowing centering control”. Enabling this feature is just a matter of flipping a dip-switch on the front of the unit. 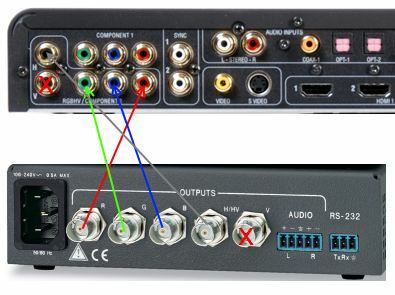 Information gained from other gaming enthusiasts suggests that this does improve compatibility in certain situations, such as when connecting the XRGB3 directly to a TV’s VGA input. However, the ADSP feature alone yielded no significant improvement when using the Extron RGB 580xi with the DVDO Edge. For several months I wrote off the 580xi as a failed experiment, it wasn’t until July 2011 that I made a chance discovery. While experimenting with the DVDO Edge’s RGBHV inputs in an attempt to improve the picture for retro-consoles (specifically 240 and 288p sources) I discovered something remarkable. Firstly, the Edge’s RGBHV inputs actually accept RGBC too, that is, red, green, blue and a combined sync signal. As I experimented further, I discovered that not only is this signal type accepted, but RGBC seems more compatible than RGBHV. In short, by removing the vertical sync from the equation, compatibility is improved at zero cost to picture quality. Sega Megadrive/Genesis using the Sega Master System Converter and the XRGB3 – Unusable without this trick due to frequent screen blanking, with the Extron in the chain things are much improved. Some games show minor screen warping at the top of the picture, while others run perfectly in either PAL or NTSC. Note – You will (very likely) need a Genesis console that outputs a pure sync signal, see this page for more information. You may also need to power cycle the Megadrive/Genesis and/or wait a moment for the signal to settle down, but it will eventually sync and become stable. Xbox 1 VGA cable – The “Frozen” VGA cable for the Xbox 1 requires a custom BIOS to be installed in the console. Without the Extron CSYNC trick this cable was unusable due to frequent screen blanking. With the 580xi configured as above, the picture is 100% stable (however after testing I still preferred Component on the Xbox 1 due to some strange issues with picture brightness on VGA). There’s a strong chance this trick may fix problems when using the Neo Geo AES/MVS, XRGB3 and DVDO Edge combination, but since I don’t have a Neo Geo to test I cannot confirm. Note:- According to accounts from other gamers, this trick does not fix all problems with the MVS or AES consoles. How much does the Extron RGB 580xi cost and where can I get one? While Extron do still produce the units, it is likely to be much cheaper to purchase a second hand unit from E-bay. As VGA is slowly being phased out in favour of HDMI and DVI connections, the 580xi and other Extron RGB units show up quite often for auction. Expect to pay around £80/$90, though if you wait you can get them much cheaper still, there were four on E-bay recently for just $25 each.